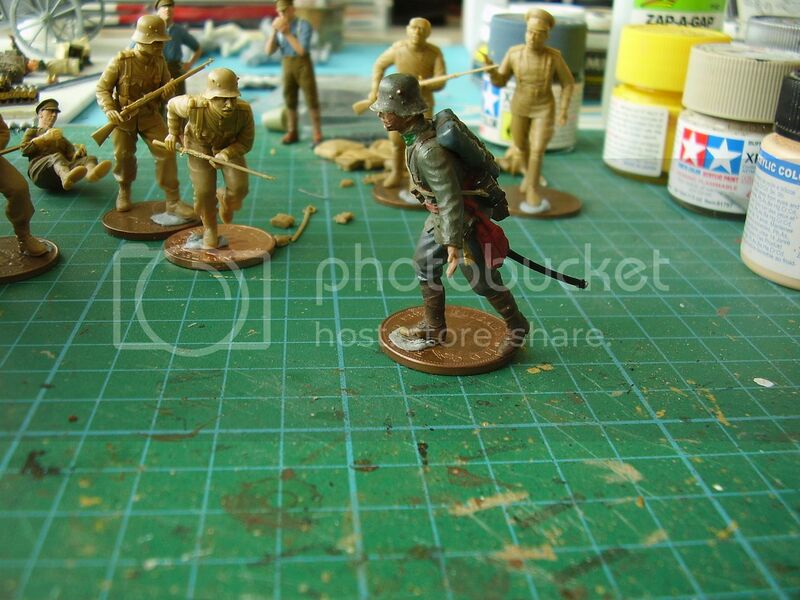 Following on from the release of the WW1 Austro-Hungarian Infantry Weapon and Equipment set ICM have just released a 4 figure set of Austro-Hungarian Infantry. The Austro-Hungarian Army provided the ground forces for the Austro-Hungarian Dual Monarchy which existed from 1876 until 1918. The army consisted of three elements; the Common Army which was recruited from all parts of the country, the Imperial Austrian Landwehr recruited from Cisleithania and the Royal Hungarian Honved recruited from Transleithania. The tripartite army was disbanded in 1918. Dark blue tunics were adopted in latter half of the 19th century and these were in turn replaced by pike grey uniform which was used in the early stages of WW1. The box art depicts pike grey or blue/grey and as the set is for 1914 then perhaps either might be correct? That said the painting instructions indicate Intermediate Blue for the uniform colour with a Semi gloss blue stripe on the trousers and collar of the tunic and this is reflected on the side images on the box. 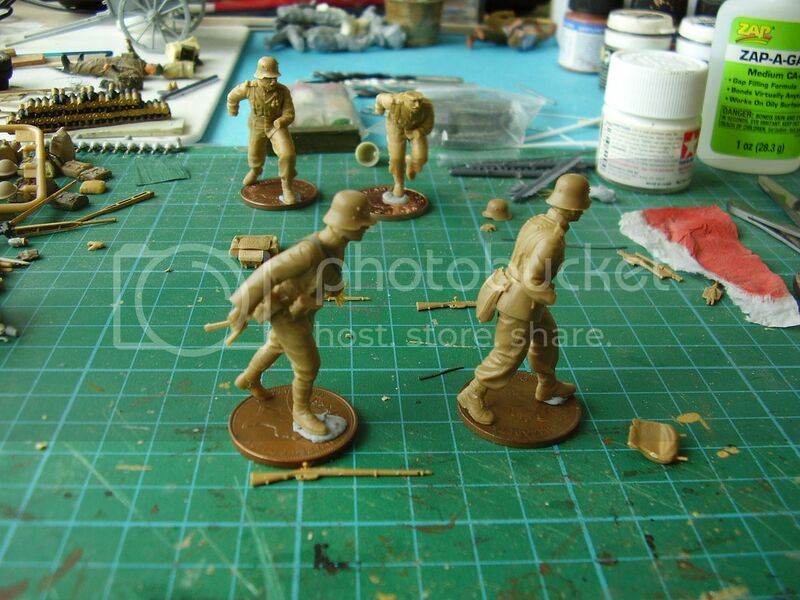 The set comes packed in a sturdy cardboard box with a colour image of the 4 figures advancing across open ground. It displays the product number and title and the manufacturer. Inside the box are two sprues of buff coloured plastic containing the kit parts which come sealed in a plastic envelope. The envelopes are worthy of a mention as they fold over and self seal. Also included in the box is a double sided set of build and paint instructions, one for the figures and one for the additional sprue of weapons and equipment that come with the kit. The set is made up of 4 figures (sprue B) and a weapons and equipment set (sprue A) from the recently release kit of the same name. The weapons set had already been reviewed by Darren Baker and a link to that can be found at the end of this review. 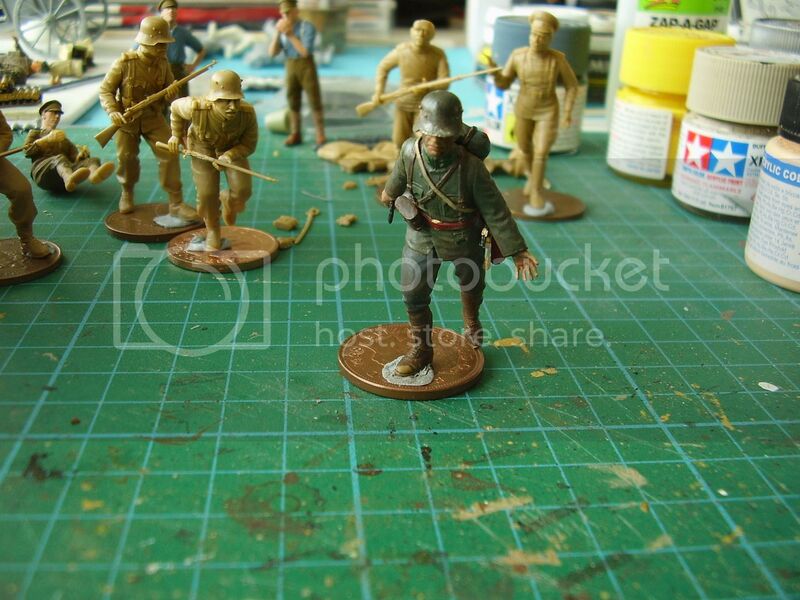 Two sets of detailed instructions accompany the set one for the figures and one for the weapons. They contain a painting guide and this seems logical and fairly easy to follow, matching the part numbers on the sprues. So let’s have a look at the figures, all of which are structured in the normal fashion, with separate head, headgear, arms, legs and basic equipment. The figure consists of 10 parts, the upper torso, legs, arms hear, cap, sword, rolled blanket and leather case. The detail on the uniform and equipment looks extremely well done for injection moulded figures, possibly the best I’ve seen. There is little if any flash and just some very fine seams to be removed before you get to building. The high collar tunic jacket seems correct for the uniform and period, there is good pocket and collar details, the leather equipment straps are very well done, both buckles and buckle holes being present. The detail on the leg, boots and gaiters is equally well done. The hand and arm detail is also excellent, the right hand holds a pistol and the left hand shows open fingers. The head has the face of mature officer with a moustache and to top the head you get a nicely sculpted cap with good detail. There are optional helmets in the equipment set should you wish to use them. Additional equipment for the officer is a fine sword and leather case and rolled blanket. The sword is worn on a sash and has a nice tassel hanging from the hilt. (Note; the sash around the waist covers the belt buckle). Both the leather case and blanket have every fine detail. The only thing you need to add to him is a pistol holster, two of which are provided on the equipment and weapons tree. The three advancing infantry comprise the same basic parts from sprue B. Upper torso, separate legs, arms, hands, head, cap, back pack, food bags. Two of the figures have additional uniform detail on the left breast area of the tunic in the form of hanging tassels, whilst the third doesn’t. One figure is in the on guard position, the other running slightly bent forward and the third, advancing soldier almost in the first motion of thrusting the rifle and bayonet. The trousers, boots and anklets are all very well detailed, although you might lose a little boot detail removing the fine seem. Additional equipment of rifles, bayonets and spades, picks and water bottles is available on the equipment and weapons sprue so you can kit out you troops to suit you preferences or needs, and the separate hands supplied with each figure should allow for weapon fitting variations. On the two soldiers whose feet are off the ground; on the running chap the boot studs have been added and on the other the heel plate and start of the sole on the boot is present. The parts all have very fine seems that need to be shaved off but that is normal for plastic injection figures and these cleaned up very easily. The parts fit very well together, and if there are any gaps then that is likely down to my clean up and building skills. 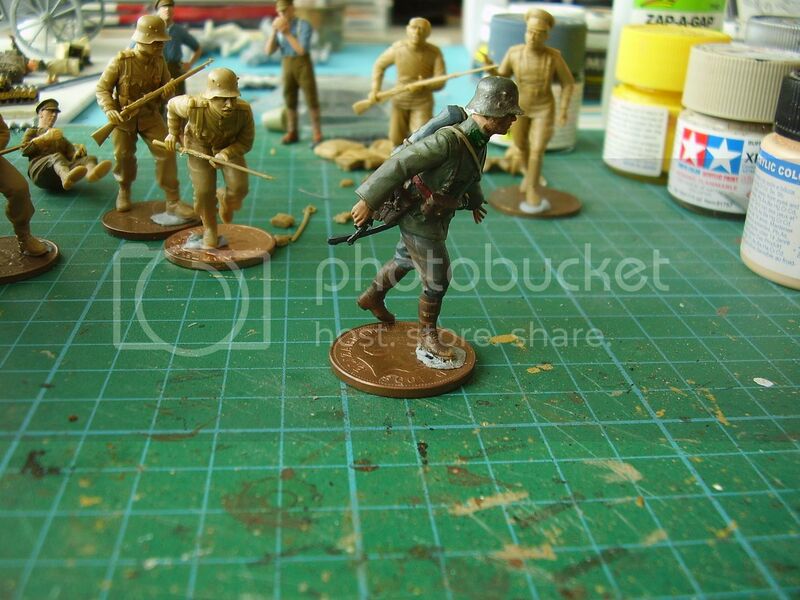 The body proportions look good, the most upright of the leaning infantry measures approximately 40mm so at full height would be perfectly acceptable in 1/35 scale. As advancing infantry they work well, although one of the figures looks to be more in a thrusting bayonet pose so he'd fit a close contact situation better than advancing across open ground. Again when cleaning up the parts I couldn't help but be impressed with the sharpness and level of detail ICM have achieved, these are very close to resin quality as far as that is concerned. 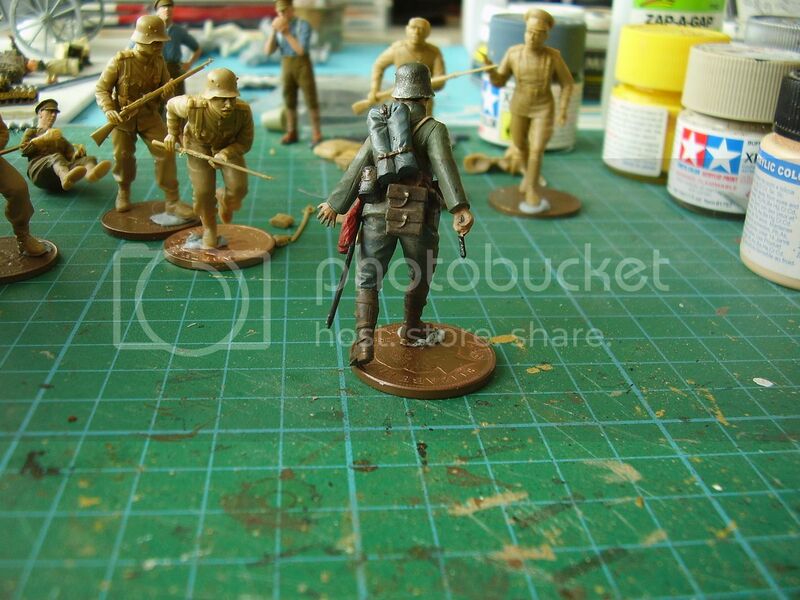 In fact I was so impressed I sent off for the two Osprey books on the Austro-Hungarian troops as with a great selection of kit and equipment I'd like to finish them with coal scuttle helmets and in pike grey, but I need more information on the uniform styles before I go down that route. One thing I'm slightly confused on is the rear haversack. It comes with what I think is a pleated belt and two buttons that was part of the uniform but I'm not sure if this is so and they should sit higher on to the belt, I'll have to track down a suitable picture to find out unless anyone knows? 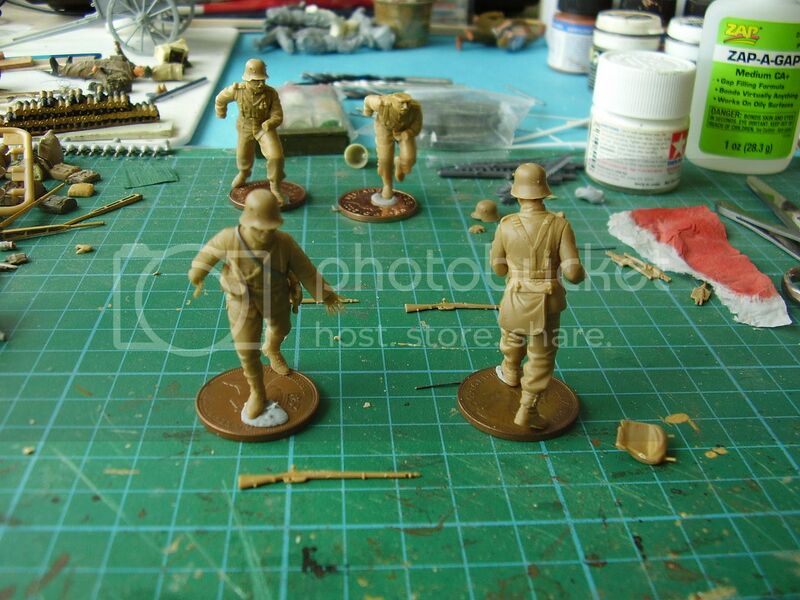 These are some of the nicest injection moulded figures I’ve come across. The level of detail to the uniforms and kit is 1st class, the moulding is crisp and detail sharp with little clean up required. The additional equipment sprue provides a great selection of items to individualise the builds, whether it’s a change of head gear or a choice of weapon, you’ll still have kit to spare. I’m no expert on the Austro-Hungarian army, but these appear to be extremely well thought out and could be finished in old or new uniform style as I can’t see much that changed except the basic uniform colour and equipment like helmets. Osprey Publishing have two books available on the Austro-Hungarian Army in WW1; Book (1) and Book (2). I don’t have either reference but from the on line pictures these chaps fit very well with the uniforms displayed in book (1). This is my first look at any of the ICM figures and I’m impressed with everything that I’ve seen so far. An excellent set of figures that should paint up extremely well and who come with a very useful and detailed equipment and weapons selection. These will certainly make of an unusual and interesting project. Highs: Terrific detail and optional equipment finishes.